What do Harley Quinn and the Little Mermaid have in common? Can Red Riding Hood’s wolf character be found lurking in a Captain America story? These were the types of questions asked at my final panel of GGC ’16. Made of members of The Geek Embassy, a learning community for new geeks, the panelists included Rhonda Oglesby, lead ambassador and teacher; Regina McMenomy, Ph.D.; Isabela Oliveria, tech editor, geek writer; and Jennifer Leaver, psychology teacher, expert in fairy tales, and newly into comics. Brothers’ Original Fairy Tales via NPR. The focus of the panel was how, and what, fairy tales can teach us about superheroes. The panel opened the topic to the audience right away, asking them “What do you know about fairy tales?” The answers revealed a range of fairy tale knowledge including the notion that these were not tales meant to teach a moral lesson, to the more interesting revisions made by the Brothers Grimm. For instance, did you know that the Brothers’ changed a lot of the mother characters in their versions of tales to step-mothers, as they didn’t like the idea of mothers doing terrible things to their biological children? I sure didn’t. As with any scholarly pursuit, it’s best to agree to specific conceptual definitions before diving in. After gathering the audience’s first assumptions and knowledge of fairy tales, it was time to bring out the definitions. After vigorous research, the Geek Embassy team have defined fairy tales as “a genre of storytelling distinct from myth, legend, or nursery rhyme.” The characteristics that define a fairy tale are easy to identify. Fairy tales, as opposed to their story counterparts, occur out of time. 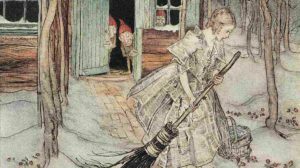 Although any storyteller can place Hansel and Gretel into a specific period in history, the story’s success as a narrative is in no way tied to when it takes place. Additionally, fairy tales set themselves apart as they are generally flights of fancy, using larger-than-life characters and plots. There is also usually an element of magic involved. Panel Recap: ¿Cómo Se Dice “Nerd”? One of the priorities of GeekGirlCon I am most proud of is its commitment to creating space for communities that have been traditionally left out of mainstream geek culture. In the case of GeekGirlCon’s identity-centric panels, it is actual, physical space that is being created. My favorite panel of this kind that appeared at GeekGirlCon ‘16 was called ¿Cómo Se Dice “Nerd”? and set forth to discuss the reality Latinx nerds face when engaging with geek culture. Panelists Sylvia Monreal, Olivia Hernández, Jorge Albor, and Tristan Tarwater began the conversation by addressing, outright, how fundamentally linked mainstream geekdom is with consumerism. In other words, one’s ability to participate in geek culture is defined by their access to capital. Therefore, historically poor communities have had to innovate new and different ways of interacting with nerdy content. We’ve all had that moment. You know the one where you hear a voice and stop in your tracks. Who is that? 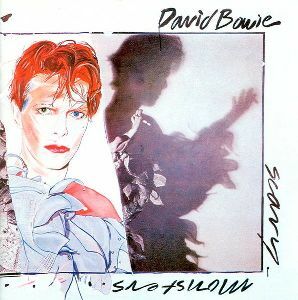 It’s on the tip of your tongue, if only you can remember… Wait… I know that voice! GGD ‘16 was filled with incredible panels, but one of my favorites focused on some of entertainment’s most exciting women in voice over. 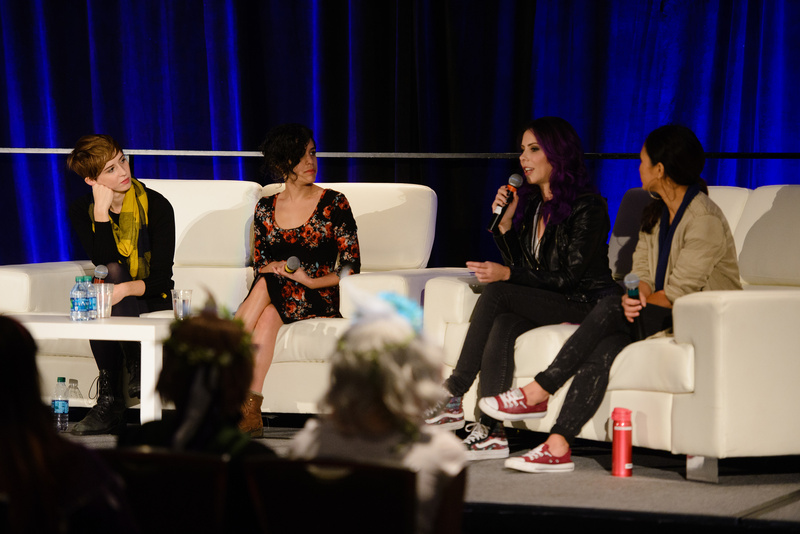 The panelists included Ashly Burch (Borderlands 2, Life is Strange), Sarah Elmaleh (Gone Home, Call of Duty), Michele Morrow (Embers of War, Dragonstone), and Jennifer Paz (Steven Universe, Mulan). The panel was moderated by Amalia Larson. I am my most geeky when I’m thinking about Harry Potter; this is an objective truth about me. And so, when I saw that there was going to be a panel entirely about Harry Potter and critical approaches to considering it, I planned my entire con weekend around attending it. The panel was called Finding Your Place in the Wizarding World: Race & Identity in Harry Potter. The fours panelists were Robyn Jordan, who you may know as co-host of the podcast #WizardTeam; Sabrina Avila; Isabela Oliveirla; and Olivia Hernández. Robyn began the conversation by proposing that the blood status metaphor—one of the key themes in Harry Potter—is not quite as overt as we all may like to think. While the allusion JK Rowling draws to race in our world via blood status in the Wizarding World is obvious to many PoC readers, it’s not necessarily clear to everyone. This affects how race is discussed throughout the fandom and how readers, especially those of marginalized identities, are able (and allowed) to engage with the story. 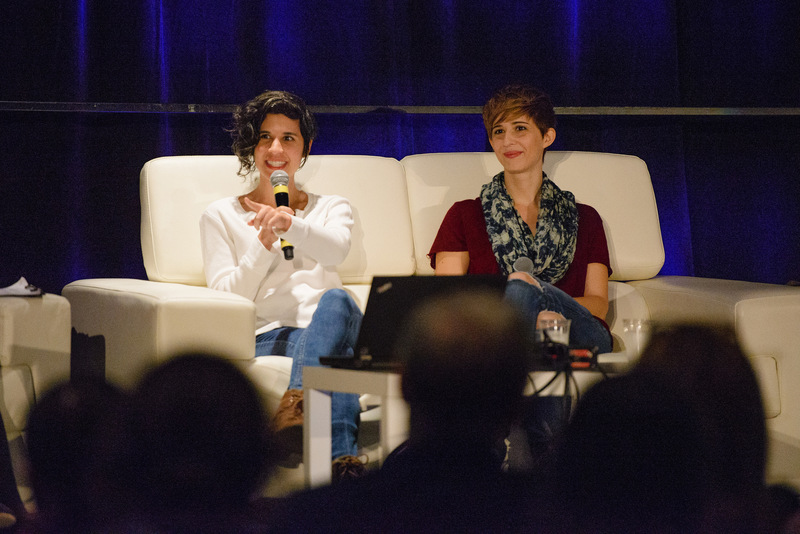 Sarah Elmaleh & Ashly Burch, who immediately ignited this gamer’s heart as the voices of Katie from Gone Home (Sarah) and Tiny Tina from Borderlands (Ashly), graced us with a casual Q&A about their journey to the geek life GeekGirlCon 2016. It was immediately obvious that the two are close, the friendly chemistry on stage could light up the room. You weren’t just watching a Q&A, it was a conversation between friends. No different than meeting someone for coffee to talk about their career and get some adivce, we got a little glimpse into how these two successful women grew as actors, writers, and dreamers. 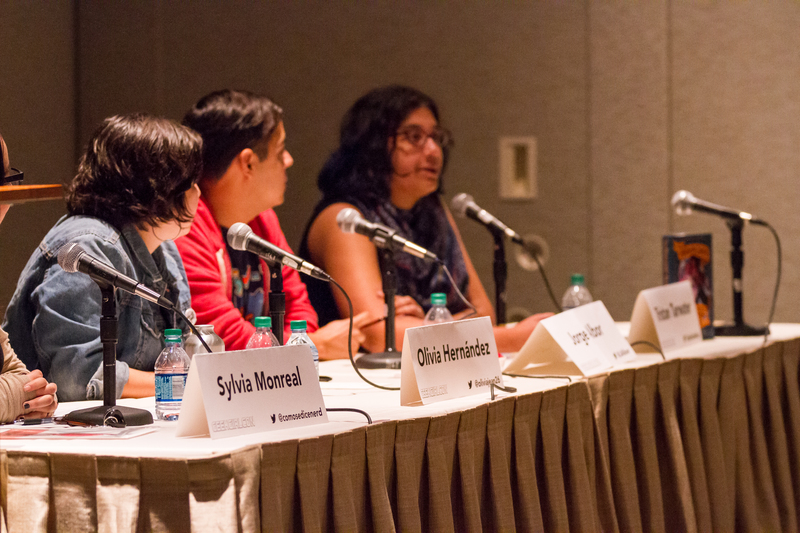 If there was one panel I was looking forward to the most at GGC ‘16, it was The Women of Nerdcore. 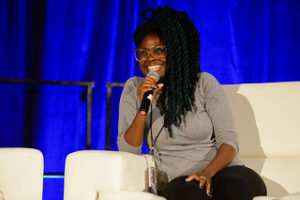 Featuring artists SAMMUS and Shubzilla, this panel focused on the interplay between music and geek culture and the female identity in traditionally male dominated fields. My first panel of GGC ‘16 was with the super smart young women of Holy Names high school’s FIRST Robotics team. FIRST Robotics is a mentor-based program for youth engagement in science and technology. They offer programs for all age groups with a focus on STEM concepts. The FIRST Robotics Competition is a high school-only where teams of students develop, build, and program their own robot. Students must follow strict rules, are given limited resources, and have only six weeks to complete their project. Once completed, teams compete in a difficult field game where their industrial-sized robots are put to the test. Early last September, the GeekGirlCon copy team huddled together to discuss and assign some of the most important jobs at the con (well, to us). With a nearly finalized schedule in hand, we gathered around to pick with panels we would each be covering to write up, as I am now, to help invoke all of those con feels we all felt in October. When I first learned about The Women of Pixar panel, I knew that I needed to cover it. Before realizing my personal calling to become a writer, I started my college career at Ringling College of Art & Design in their Computer Animation program. Although I ultimately decided to switch fields and focus solely on storytelling through writing, my love of animation (especially Pixar) is strong and true. Although I was never introduced myself, some of the contributors on the panel worked closely with a handful of my friends and former mentors, so I was already familiar with some of their work and stellar reputations. It may have been because I looked mildly crazed as I requested it, but I was unchallenged when I asked to cover the panel. I set up camp right in front of the main stage, as I was assigned to the first three panels that were being hosted there: Inclusion & Evolution of Female Role in Modern Animation, the Q&A with Ashly Burch and Sarah Elmaleh, and finally, The Women of Pixar. By the time the first of those panels had come and gone, the convention floor was just starting to buzz with activity. More people filed in for the Q&A, but then it happened. 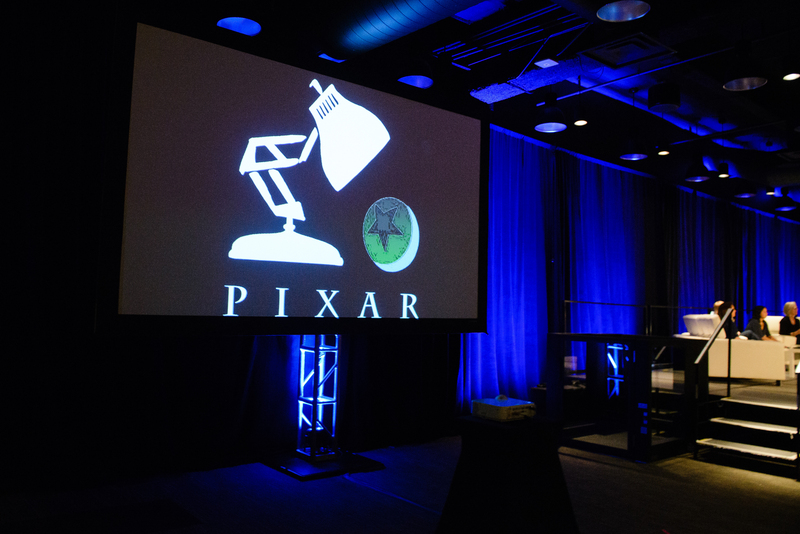 Like there was a mass consensus, what seemed like hundreds of attendees swarmed the hall the minute the Pixar logo was flashed across the two large screens that flanked the stage. So many people, in fact, that it immediately turned to standing room only. Guests young and old, readied with notepads and cameras, collectively gushed about their favorite animated films in anticipation of the panel. Current and prospective animation students, curious passersby, and fans alike gathered together in what I thought to be one of the liveliest crowds at the ‘16 con thus far.